Pulling and spraying weeds is so old fashion. Seriously, how are you going to get respect in your lawn if you have to excruciatingly hurt your back just to rid the lawn of weeds? I'm sure all of the other weeds are pointing and laughing at your pathetic attempts. The Weed Burner lets you smoke the weeds, legally. 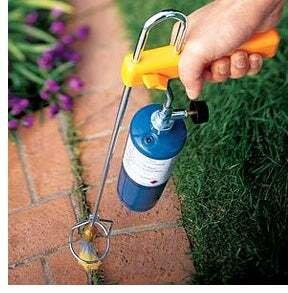 This small, lightweight device has an attached propane bottle and is essentially a miniature flame thrower. Stick it above the weed and burn away. Don't have weeds? Buy one anyway. There is an attached control valve that regulates the amount of flame. Sounds like boatloads of fun to me. It is available for $35 over at the 'Zon.